If flowers aren’t your fiancé’s thing, we have some good news. Rather than a bundle of blooms, you can now gift your groom a bundle of beef jerky, thanks to sites like Say It With Beef and Manly Man Co. According to Say It With Beef’s website, its “broquets” are “handcrafted and made from over [half a pound] of 100 percent high-quality beef jerky” in four flavor options. In case you were wondering what type of cured meat best suits your significant other, the flavors include original, peppered, teriyaki and mixed. 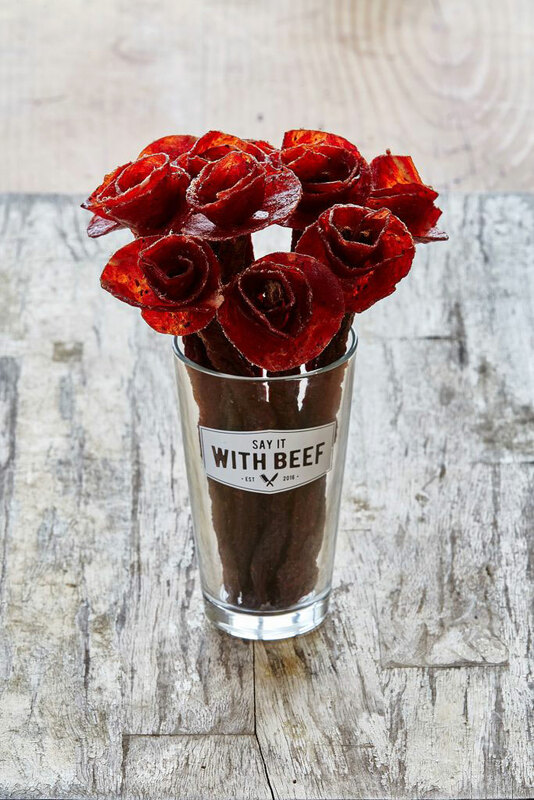 Manly Man Co., on the other hand, promises beef jerky bouquets that are “made for that rugged one-of-a-kind, hammer-swinging, IPA-drinking, duck-hunting, beast of a man-animal you call yours” and comes in a Manly Man pint glass. Yes, you read that correctly. Unfortunately, both sites’ broquets are on backorder and won’t arrive in time for Valentine’s Day, but you can expect to receive them in a few weeks instead. If you’re willing to shell out $69 or $49 on either site, respectively, then it could be a comical addition to your wedding day décor. So whether you’re looking for a palatable gift for your groom, or you’re just a carnivorous bride yourself (hey, no judgment here), we say bon appetit. Be the first to comment on "A Beef Jerky Bouquet Is Exactly What Your Fiancé Needs While Wedding Planning"